Spaces free of fear, free of bullying and harassment of any kind. 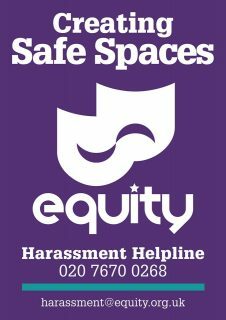 Equity, the UK trade union for professional performers and creative practitioners, which represents 43,000 people in the entertainment industry, has launched its new initiative to tackle the entertainment industry’s sexual harassment crisis. The ‘Safe Spaces’ campaign aims to gives members “the confidence to challenge inappropriate behaviour and to report it knowing that the union is always there for them”. Part of the campaign is to promote awareness of the union’s ‘harassment helpline’, a way for members to report any incidents or concerns regarding themselves or others, through posters which will be put up in workplaces such as rehearsal spaces, casting suites and green rooms. The union has also created a statement to be read out to both cast and crew at the beginning of any production’s rehearsal period. The statement will demonstrate a company’s commitment to creating safe spaces ‘free of bullying and harassment’. The statement reads: ‘Every single one of us working on this project is entitled to work in a safe space: a space free of fear, a space free of bullying and harassment of any kind. We will work together honouring our differences and celebrating the gifts we each bring to the table. ‘We will treat one another with politeness and respect at all times and, if we are subjected to or witness bullying and harassment, we will speak out knowing that our voices will be heard and we will be taken seriously. Together we can create a safe space’. The need for this type of campaign was first discussed in the union’s Agenda for Change, which was produced following research from Equity’s Sexual Harassment Working Group. The Agenda explained how the union, engagers, agents, casting directors, boards, educators and workplaces must work together to create a culture shift ‘that is the proper response to the tide of horrifying revelations of sexual harassment’. The number of Equity’s Harassment Helpline is 020 7670 0268. This is one of a number of safety campaigns set up by film and theatre organisations since the details of appalling behaviour by Harvey Weinstein and then reams of others emerged. London’s Royal Court theatre published a code of behaviour in November. And in February the BFI published eight “clear and simple” principles to tackle bullying and harassment in the UK’s screen industries”. To see them, click here. For the addresses and contact information of other sources of help, click here.